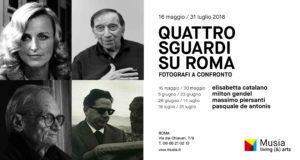 Musia presents “Quattro sguardi su Roma. Fotografi a confronto”, a series of photo exhibitions dedicated to Rome through the work of four international authors who portrayed places and personalities of the roman artistic and cultural milieu from the Forties through the Eighties: Elisabetta Catalano, Milton Gendel, Massimo Piersanti e Pasquale De Antonis, that will rotate every two weeks from May, 16th to July, 31st. This project is curated by Barbara Drudi and Giulia Tulino and will be set up in the Galleria 9. Musia, via dei Chiavari 7/9, Rome. Open from Tuesday to Saturday 4 pm – 10.30 pm; closed on Sundays, Mondays and on holidays. © Milton Gendel, 2000-2018. All rights reserved. This website does not use profiling cookies. No personal data from visitors is collected or stored. In 2011 the Milton Gendel’s Photographic Archive merged with the Fondazione Primoli Photographic Archive.